Second only to Sailor Moon, Tuxedo Mask was one of the original suited soldiers of justice fighting for peace and love on behalf of the citizens of Tokyo. In addition to the rather substantial differences between anime and manga Mamoru, Tuxedo Mask (when taken as an individual character) was also rather different between the two. Today, we’re going to look at a few of those differences. I understand that they wanted to align this with the transformation phrase shouted out by the Sailor Team, but it might have been a wise idea to use another term rather than make up, but that’s neither here nor there. 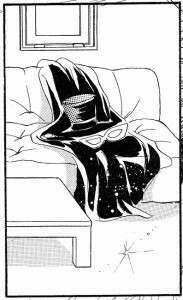 Though it appears that he may actually gain the ability to transform later in the series (around the Black Moon Family arc or later) since we never really witness Mamoru himself actually walking around in a tuxedo later on, at least in the very beginning Mamoru was actually actively dressing up in a tuxedo and mask when he was running around and playing super hero. That brings us to difference number two! We can assume that this would also mean that when Usagi had used the power of the crystal to cure him, she also gave him additional powers that were normally not granted to humans. Read also: What Do the Colors on Sailor Moon's Brooch Mean? So as you can see, there were quite a few differences in the character in both his human and super hero forms, with both of them being equally interesting in my humble opinion. Though with some characters like Rei, the anime took some pretty drastic liberties, I feel like Mamoru was a pretty unique character in both incarnations. Which is your favorite? ← What Do Queen Serenity and Queen Metalia Have in Common? Is recent-musicals Mamoru/Tuxedo Mask an option? The winking! Oh my! I would love to look more into the musicals and how the characters developed there. It really is a completely different universe! The bigger problem is that there isn’t really a bad version…! I was amused by his portrayal in the Sound Drama’s. They send him up completely in those. His ‘Usagi in danger’ sense for one thing. I’ve only listened to a few, but I’ve read summaries of the rest and they really seem to be focused more on comedy than even the anime. But I think it does open up an interesting side of the characters you usually don’t get to see in the anime, since they need to focus more on battles in the latter half of every anime episode. I hear that the anime comic adaptations done by Kodansha (where they take anime screenshots and add text bubbles) had a slightly different storyline of their own, due to having to compress 2-3 episodes into one book. I haven’t taken the time to read through them yet, but I’d be interested in seeing if — and how much — the characters actually differ! How did I not even know that those exist?? I’m going to have to get googling! If you have a chance you definitely should! I think there are some subtitled sound dramas available around the internet. You should definitely check them out! Oooh right. The language thing. Good news! MissDream posted a translation of the Sailor Moon S sound drama back in 2013. Perfect, thanks for doing the searching for me! They’re a sadly overlooked and obscure part of the franchise, but it’s enjoyable hearing the cast basically having fun with their characters more then usual. Miss Dream also has another one ‘Anime Cassette Collection’. It’s like a lost episode in a sense, as it serves as a sequel to episode 21. Oh, does she? I don’t believe I’ve heard that one, but I’d definitely be interested in any effort fans have for preserving these things. Unlike CDs, cassette tapes ultimately have a limited lifetime, so it really is just a matter of time until they’re all gone. Definitely need to check out that episode! Actually I think you are seriously underselling the power of anime Mamoru/Endymion. While it is true that he does not gain an energy attack like “Smoking Bomber”, he loses his role in powering the Silver Crystal, and even loses his direct link to the Golden Crystal I still think he may actually be significantly MORE powerful in the anime than the manga. Strength/Leaping – Just like all the Senshi he has enhanced strength and leaping abilities. He can jump across rooftops with ease, and in Venus’s debut episode he is able to leap the height of a tall crane, catch Sailor Moon, and land safely on the ground without issue. Sensing – He can sense when Sailor Moon needs him and where she is. He can also sense some kinds of energy such as when Zoisite (as Sailor Moon) fired his tiny energy crystals to eat away the ropes holding the window washers platform, Mamoru is able to see the shards and energy within burning away the ropes when no one else can. Pscychometry – He only uses it once but anime Mamoru has it too. When he first holds Chibiusa he does get a vision of Crystal Tokyo just like the manga. Not much is made of it here as it gets quickly overshadowed by the break-up arc “visions”. Healing – I think it’s just the one time he uses it but remember how he is able to channel his life force to “heal” Chibiusa to keep her alive after her pure heart crystal is stolen for an extended period of time. Teleportation – First hinted at back when he doesn’t know he is Tuxedo Mask. But when he senses Sailor Moon is in trouble he can seemingly teleport to her location. It also would explain how he is able to get to such strange high/small places for his entrances without being seen. The best and most undeniable use of this ability however is in 1×34. That’s the one where Moon and Mask find out each others identities. 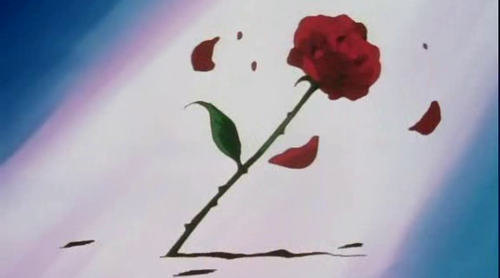 After the reveal during their confrontation with Kunizite and Zoisite, Tuxedo Mask is standing in front of Sailor Moon. Zoisite sneaks up behind Usagi and launches his icy spear at her back. Tuxedo Mask senses it and is suddenly behind her having been impaled from behind. There is no other way he could have gotten behind her without that quick without teleporting behind her. However all these pale in comparison his ultimate power. Anime Mamoru has insanely powerful psychic abilities! Another example of Tux’s psychic prowess is when he went up against Prince Demande. The first time that Demande attacks when the group was together at the palace the Senshi were all in pain unable to move an inch. It is Mamoru who is the only one still able to easily move and thus able to hurl his cane at Demande causing him to cease his attack. The second time when he rescues Sailor Moon from his clutches…Demande again tries his paralyzing psychic power AND even hits him dead on with a psychic beam fired from his third eye. Tux blocks it with only his cape and is completely unfazed as if he was just hit with a flashlight beam. 1) Converse with his younger self and Usagi while they were asleep. 2) Project the images in their dreams that he wanted them to see. 3) Either actually shatter the glass in picture frames, or just mentally project the permanent image of the broken glass frames in their minds while they were still awake! You know it also just occurred to me that it is actually kind of interesting that anime Mamoru had the power to manipulate dreams here in R long before his Golden Crystal was fleshed out in the manga with its tie to dream power? Could Naoko have indirectly drawn some small bit of inspiration from the horrible break-up arc? 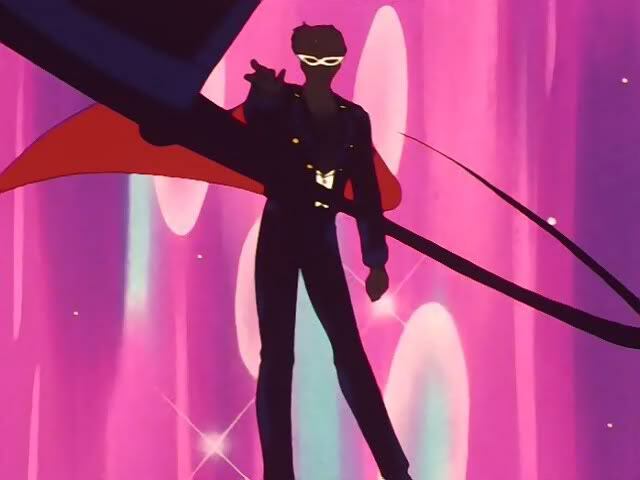 I think Mamoru/Tuxedo Kamen is overshadowed and sometimes his own role in the series is misguided by the immense power we all know Sailor Moon has. I think Mamoru may be even stronger than Sailor Moon. For instance, he has abilities Usagi doesn’t have unless she transforms. He carries a crystal that it is portrayed to be the counterpart of the Silver Crystal, I think thst part of him needs to be a little more explored, I think the fact that there is much mystery around his character gives way to think there is more than meets the eye with him. I agree with Xenox33, with exception of thinking that anime Mamoru is stronger than his manga counterpart. I think is the other way around, plus, we get to know more about him than in the anime since he is constantly portrayed as a guy who throws roses and gives speeches no one really understands. Anyways, those are my two cents. I just found this webpage and I am already loving it. The reason why he has powers in the manga is shown to be his Golden Crystal. It may not be present until Sailor Moon SuperS but he has the ability to draw from its powers Another explanation for his ability to use his powers without “transformation” in the manga is that he is on his own planet and can tap into his powers any time. 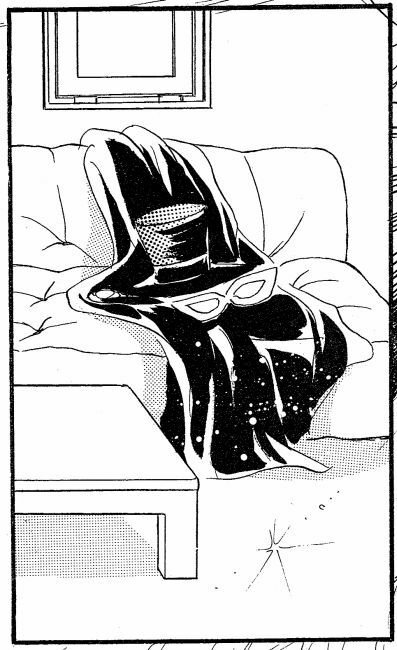 Its never shown but I have a feeling that the same powers would be granted to any of the senshi on their own planet. 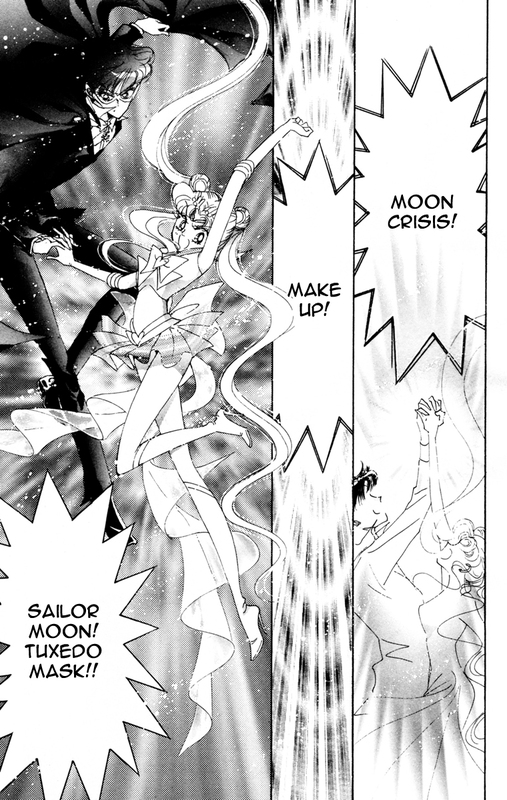 Actually, as someone on Facebook pointed out, in Act 36 of the manga, when Chibi Moon joins the fight after Hotaru´s sacrifice, we see Mamoru transforming into Tuxedo Mask. There was that one frame, where he´s drawn in the same manner as Usagi when transforming (silhouette of a naked body & some special effect). No phrase was used, though, I still think it was meant to be a transformation. What a pity they didn´t play with it in Crystal. You know, you’re absolutely right! Thanks for pointing this out, I totally didn’t remember that. 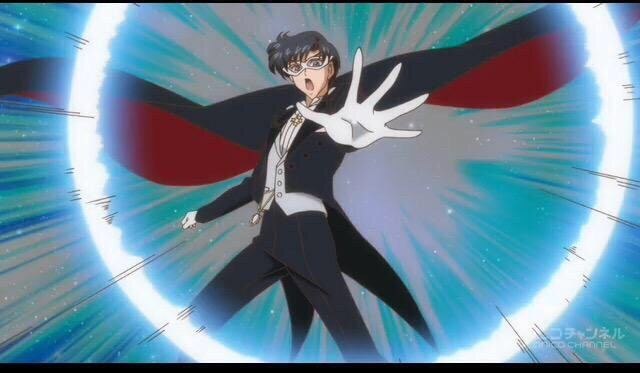 I wonder when in the series he would have transitioned over from “dressing up as Tuxedo Mask” to “transforming into Tuxedo Mask.” Around the time he got the Golden Crystal? I know this is a super old article, but I’ve been thinking about it since you relinked it on twitter a few days ago. The idea that manga Mamoru gets his powers from the ginzuishou strikes me as odd, because he has powers that Usagi does not. Usagi can’t heal wounds, she can’t put her hand on the ground to sense where people are, she doesn’t see visions of Crystal Tokyo when she holds Chibi Usa, and she doesn’t get premonitions nearly as often as Mamoru does. Plus, I was under the impression that King Endymion was talking only about the ginzuishou extending their life spans after Crystal Tokyo started, and that it applies to all the senshi, not just him. 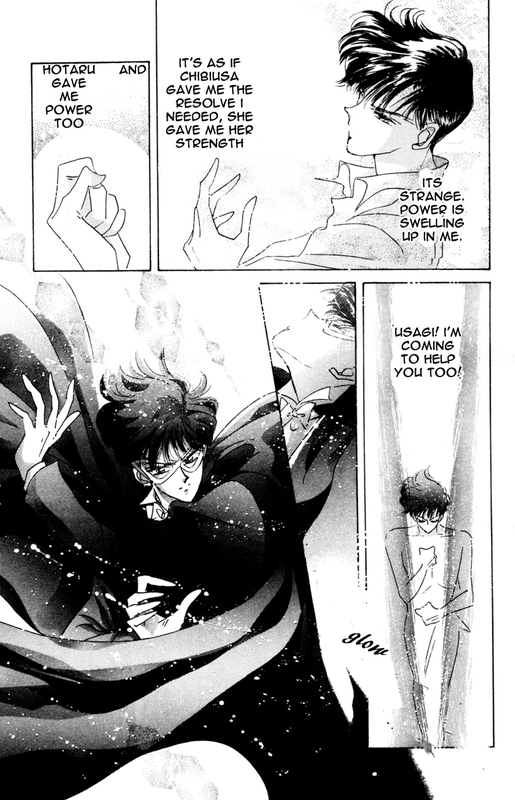 I think what is more likely is that Mamoru does not know he even has powers he could use until he regains his memories. Unlike Usagi, he never had a talking cat to just tell him what he could do. The first time he uses powers is during the Metallia fight at the end of the Dark Kingdom arc, first to give Sailor Moon some of his energy, and then to use his psychometry to find out where the Inners are. It seems odd that Mamoru would just confidently use these powers if they had been gifted to him a moment before by the ginzuishou bringing him back to life. I think it’s way more likely that they were always his to begin with, and he just had to remember. Plus, I feel like there would be no point to him possessing the Golden Crystal if that crystal granted no powers, not to mention all the emphasis placed on him having a sailor crystal for Galaxia to steal. He is a sailor senshi in all but the name; his powers just appear more subtle. Interestingly enough, now that I’ve been re-reading through the manga recently, I notice that Mamoru transforms in Act 4 of the manga. When he is dancing with Usagi at the ball, Mamoru doesn’t have his top-hat, cape, or neck… brooch… thing. But when she falls off the balcony and he saves her, she does. And yet, at least in the Dark Kingdom arc, we’re basically left to believe that he doesn’t transform. So it’s likely a story inconsistency, sadly. TBH, there is really only ONE scene that’s generally cited as proof that he doesn’t transform, and both the pictures and the wording seem to leave the whole thing ambiguous. If Moon can remove her tiara and hairpins to use them as weapons, we can’t assume that the senshi (and Tux) can’t take off parts of their battle uniforms without actually de-transforming. Also, look carefully at the moment where he finds Usagi about to pass out in the middle of the street (which was, interestingly enough, altered in Crystal). That would suggest that he went and changed into his tux right before waking her up, which doesn’t make sense since the chapter ends with him revealing his secret to her anyway. I guess it’s just never stated outright either way, and that’s really because he’s supposed to be shrouded in ~mystery~ in the first arc. But he is shown to remove pieces of his outfit outside of battle (the scene when Usagi wakes up in his place, and there’s another one when he wakes up wearing what are obviously tuxedo trousers), which is something the senshi never really do. Could this be a case like the Moon Kaleidoscope, which was an ordinary object they bought in the store that gained magical properties just because the senshi needed it to? Maybe the tux started out as something he physically put on but over time he figured out how to summon it whenever he wanted. There’s just a lot of ambiguity over the whole thing. It’s too bad Naoko couldn’t explore this stuff more.